What better way to highlight the wonderful flavor of lemon than in this creamy cheesecake? The kiwi fruit is what truly takes these bars to the next level though! In a food processor, break the graham crackers and pulse until finely ground. Add the melted butter and process until the mixture reaches a wet sand consistency. Transfer the crumbs to an 8×8 baking pan. Press the crumbs out firmly and equally over the bottom of the pan and set aside. In a large mixing bowl, add cream cheese, sugar, lemon juice, and lemon zest and blend until smooth with an electric mixer, about 30 seconds. Scrape the mixture down the sides of the bowl and add the eggs. Blend until combined and smooth, about 20 seconds and scrape the sides of the bowl again. Pour the cheesecake mixture over the crust and spread out evenly. Bake the cheesecake for 40 minutes or until the sides are slightly puffed and the center is dry to the touch. When the cheesecake is done, let sit until it reaches room temperature. 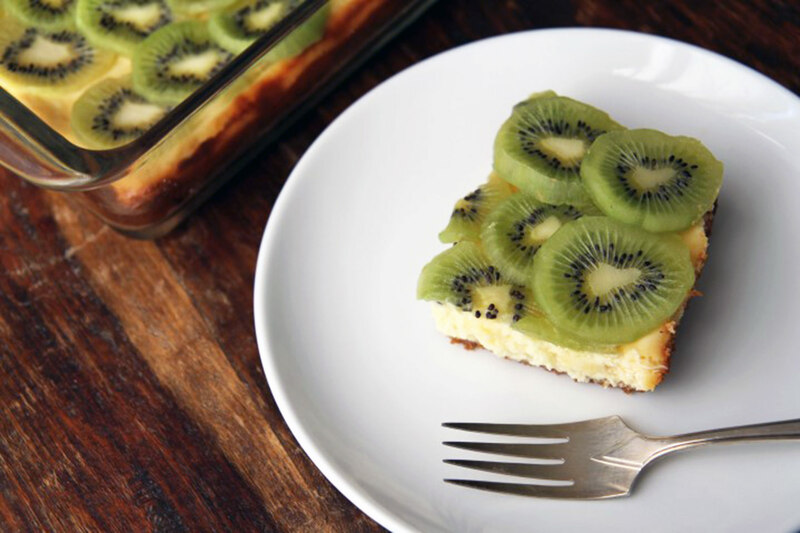 Top with the sliced kiwis and refrigerate for at least 5 hours before serving. After the cheesecake is chilled, cut into bars and serve!